A brighter future is in your hands. We’re currently seeking a Gardener who Drives. 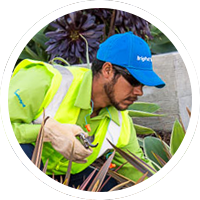 The Crew Member Driver is responsible for safely and efficiently producing quality landscape service that meets or exceeds the standards of clients and management. Maintain and correctly use issued personal protective equipment. Bilingual English/Spanish highly preferred but not required. Safely perform heavy lifting/pushing/pulling of various landscaping equipment and materials, including, but not limited to backpack blowers, large containers of mulch/plant material, various sizes of lawnmowers, etc. Walk up to 10 miles a day, sometimes uphill and on uneven terrain, often while carrying, pushing, or pulling equipment, materials, or debris.